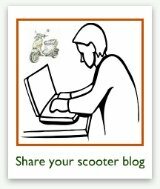 If you've been thinking about buying a Genuine Buddy Scooter, this Buddy motor scooter page may help you make up your mind, especially if you're looking for a retro scooter. OK, now I can get down to what I know best... the Genuine Buddy! 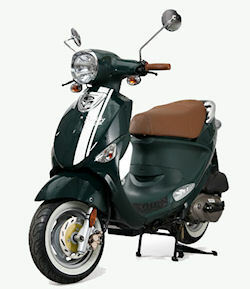 At this point, the Genuine Buddy line is several years old and it's one of the best selling scooter brands on the US market. 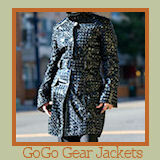 And there are solid reasons for that, including styling, quality, and performance. In its second year, Genuine Buddy expanded its color line to include the limited edition Series Italia model that I own. And that sold so well, that in its 3rd year (2008), Buddy expanded once again to the International Buddy, which included not only my Series Italia, but also the St. Tropez and Pamplona models. 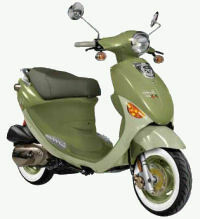 They also upgraded the motor from 125cc to 150cc in the international line (there's a 50cc version too). 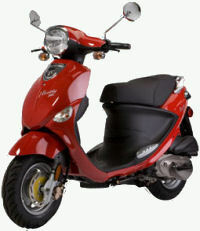 And new for the 2012 model year is a larger Genuine Buddy scooter... the 170i, with a 168cc engine! 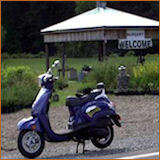 The Genuine Buddy scooter features an automatic, 4-stroke engine or a 2-stroke, 50cc engine. They say it has "retro roots in a distinctly modern package". I guess that's true. I think it's really snazzy looking and I get compliments all the time. It has front disc and rear drum brakes that I've found to work really well. I can basically stop on a dime. Other features of the Buddy are a cell phone charger on the dash, along with a plastic bin type compartment large enough to hold a fast food drink cup. I love stopping at Sonic for my favorite Lemon Berry Cream Slush on my Buddy! The underseat storage is phenomenal. I've fit 2 to 3 fairly full plastic grocery bags under there. Plus, there's a hook on the dash, where you can hang a bag that sits on the floorboards between your feet. You can buy a locking top case and rack for the back of the Buddy, or just baskets for front and back (I got the one on the back). I haven't personally taken my Buddy up over 50MPH or so, since I don't have the courage (or the need, really) to go on the highway. But there are plenty of people on Buddy discussion boards and blogs who can attest to its ability to easily get up to 60+, and I believe it. 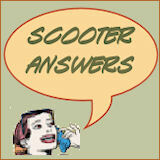 Now, whether you'll feel safe enough as semis whiz by you on the interstate is another question! I love how the Buddy accelerates, because it's so easy to pull out into traffic and not fear for your life. And it handles very responsively. And it sounds like that has only gotten better in the new Buddy 170i model. The silver and green versions also have snazzy racing stripes on the front fender. 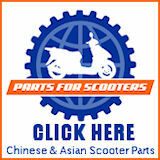 You can learn more about Genuine Buddy scooters from Genuine Motor Company here. Do you drive a Buddy motor scooter? If so, would you like to contribute your review? 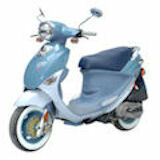 Or maybe you'd like to read about other Genuine scooters models?